I'm looking to undertake a TRD conversion soon and was looking for advice on the best place to get my TRD body kit from. Obviously I'm weighing up prices with how good the fitment of the kits are. What kit have you used and how good was the fitment, did it take much modifying to get it to fit right? Also, how long did it take you to fit your kit or have your kit fitted (whatever the case may be)? Re: Best place to buy a TRD Kit? this could save you a bit of hassle? Cheers for the link but Im looking for a kit that has yet to be fitted. Plus I live in Ireland so would be a nightmare for me trying to bring a car like that over. After a false start with a supplier in the UK who took my money and ran I turned to the US to source a kit. Did a lot of hunting on the US forums and Extreme seem to have a bad reputation and I didn't like the way they responded to criticism on the forums. Anyway, after checking out every lead I could find the one company which repeatedly came up with good reviews was VISracing. Only problem with VISTRacing is there seems to be dozens of "agents" and after emailing them I wasnt always so sure that was what they were really selling so ended up going directly to VIS themselves - a couple of hundred dollars dearer but at least your guaranteed of the quality. Cost me £1,100 all in delivered to my door. Only problem I encountered was that they sent a TOMS front bumper instead of a TRD bumper but they airmailed a replacement front bumper for free which only took 2 days to come. Did you never get your money back from the UK supplier? Can you say how it was? By the looks of things I will end up going with VIS. How long did it take you to fit your kit yourself? My kit is still not quite finished but thats my own fault!! I keep reading books on bodywork and redoing stuff! LOL Shouldnt take long though if you just get on with it - depends on how fussy you are TBH and Ive learnt loads since so could do it a lot quicker. Damn! I thought this kit included everything you needed?! Where did you end up getting the filler cap, petrol cap? Not sure whether your misunderstanding me but my VIS kit did come with everything - its the one from the UK supplier that had the faults/bits missing. Aw right, I thought you said that I would need to source these things as well. Thats sweet then if the VIS kit comes with everything, I was thinking of trying to fit it myself though tbh I'll probably end up giving it to a local shop as I don't have enough body work experience and I want a really good job done. Yeah build threads are the main thing I'd like to see more of on this forum! Anyone who ever did a TRD conversion should put their thread up here to help spur others like myself on. Most of them already have them up on other sites already so it would only be a matter of copy and pasting. Ive actually photographed in immense detail my strip down and build - just need to get round to posting it all up!!! This is how my VIS kit xame - in one enormous big box!!! Look forward to seeing it when its all been posted up. I think (but not sure) I have the only one with an EU style number plate recess too (made it myself LOL). Had to mold the plate recess of my other car then cut out the US plate and re-fibreglass in the EU plate. Still needs a bit of work to straighten it up and excuse the flared bumpere - its not bolted on at bottom in pic. Thats a nice custom modification to the bodykit! 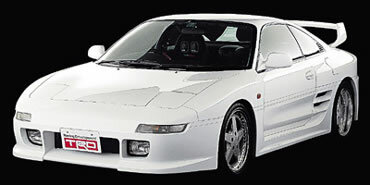 Im going to go with the Jap style plates though as i've always liked them better on MR2s for some reason. as said above i've just recently finished mine and fitted it myself with no previous bodywork experience. i would of course be more than happy to answer any questions you have and will work on getting my build thread up soon. i just want to take some completed pics before i do so! i also agree with jeff that it all depends how fussy you are on how quick it gets done. i think now i know what im doing more it would take alot less time though and there are perhaps a few things i may do differently. Cheers Jack, look forward to seeing your build when its up. Nice one Harry, can't wait to get my project underway now. That pic doesn't seem to be showing up. Is it that candy apple coloured one with the volk rims? If so, its v.nice looking, quite like that colour!